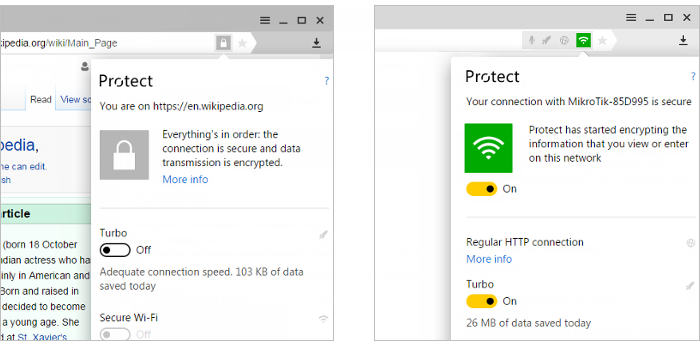 Yandex Browser uses a multifaceted security system called Protect. You can see how Protect is working in the Protect toolbar on the right side of SmartBox. In particular, the icons in this toolbar show your connection status and your security level. Attention. The connection status icon is typically displayed on the far right of the Protect toolbar. However, it can shift to the left if you open a dangerous site, if Turbo mode is active on HTTP sites, or if Wi-Fi protection is turned on. HTTP protocol is in use. HTTPS protocol is in use. Transferred data is encrypted and the site has an up-to-date Extended Validation (EV) SSL certificate. Make sure the page header shows this icon before you begin entering confidential information on a website (like your bank card number). HTTPS protocol is in use but the site's certificate is less secure than EV. HTTPS protocol is in use and the site has a current EV certificate, but there are unsafe elements loaded on the page. Data transfer might not be secure. This icon appears if the page has a form that sends data over the HTTP protocol without encryption, or if Yandex is not familiar with the publisher of the page’s locally-installed certificate, or if images load over an unsecure protocol on a page that loads over HTTPS. , This page contains dangerous elements or ads blocked by Antishock. This website could harm your computer. The website’s certificate might have been revoked or might not be current. The browser has no information about the security of this site's connection. Internal browser page (your data is protected).